Doddie Weir, right, during a previous visit to Springwood Park, for a fundraiser in January, with fellow honorary fellow Gregor Townsend. Nobody can deny that Scottish rugby hero Doddie Weir is a jolly good fellow, and bosses at Borders College aren’t about to try. On the contrary, so say all of them as they’ve named the 61-times-capped lock as their honorary fellow for 2018. The Galashiels-based college’s honorary fellowship award for this year is being made to Doddie, of Blainslie, in recognition of his contributions to sport, business and charity work. 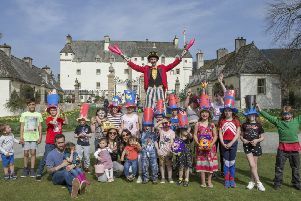 The 48-year-old will be presented with that award this Friday, September 28, at the college’s annual graduation ceremony, being held at Springwood Park in Kelso. He’ll be among more than 500 graduates and guests there on the night to celebrate their own personal success stories. Doddie, educated at Daniel Stewart’s and Melville College and the Scottish Agricultural College in Edinburgh, will be the 21st honorary fellow named by the Borders educational establishment. His predecessors include former City of Edinburgh Council leader Keith Geddes in 1998, rally driver John Cleland in 1999, politician Lord Steel of Aikwood in 2002, ex-Southern Reporter journalist Jill Douglas in 2004 and horse-racing champion Ian Stark in 2007. Scotland rugby head coach Gregor Townsend in 2000, Scottish international footballer John Collins in 2011, fellow rugby international Chris Paterson in 2013, bookshop boss Rosamund de la Hey in 2015 and charity champion Wilma Gunn in 2016 are among the others to have been made honorary fellows of the college.